I have a sort of love/hate relationship with bacteria, as I think many of us do. Over the years, I’ve experienced the usual number of infections from “bad” bacteria, grateful each time for modern antibiotics. On the other hand, I can barely imagine a diet without cheese, wine, soy sauce, sourdough bread, and many other fermented foods that are among my favorite things in life—and without “friendly” bacteria, this whole range of foods could not exist. More to the point, without our intestines being populated with bazillions of beneficial bacteria, we’d be unable to digest any food. So on the whole, I’d have to say I’m quite fond of the little critters. Kefir bears more than a passing resemblance to yogurt (or, at least, yogurt-based drinks): it’s much thicker than milk, has a tangy flavor, and is formed by the action of live cultures. But the differences are significant—starting with the microorganisms themselves. Kefir production begins with something known as kefir grains, though “grain” is an odd choice of word to describe this substance that is white, rubbery, and roughly cauliflower-like in appearance. The grain is formed from a conglomeration of over 30 kinds of bacteria and yeast, along with a structure of proteins, fats, and sugars that the organisms create to live in. This may sound yucky, but it’s actually rather fantastic: this mega-colony has emergent properties that make it act as though it were a single entity. It grows (when immersed in solutions containing sugars or starches) and repairs itself when damaged. Even more interesting, the various types of bacteria are able to defend the entire colony against foreign pathogens in a way that any single strain could not. Producing drinkable kefir from kefir grains couldn’t be easier: put some grains in a glass container of milk at room temperature and wait 24 hours or so. During this time, the liquid thickens due to the bacterial action. When it has reached the desired consistency, strain out the grains (which, in the process, will have grown a little bit), and pop them into another container of milk for tomorrow’s batch. Repeat indefinitely—as long as kefir grains have a relatively consistent supply of food, they can live, theoretically, forever. When a clump of grains grows too large, you can pull off a piece and eat it or share it with a friend who needs a kefir starter. According to an old ethic of kefir making, the grains must never be sold, but may be freely given away to anyone who wants them. As a result, there are websites where you can search for one of the thousands of people all over the world who are willing to mail you, for the cost of postage alone, enough kefir grain to start your own production. But, old ethic or not, it’s even easier to find people or companies that sell kefir grains (online or otherwise). This drink originated in the Caucasus Mountains eons ago, most likely as a method of preserving milk for long periods of time without refrigeration. According to legend, the first kefir grains were gifts from the Prophet Mohammed; where he may have obtained them is anyone’s guess. In any case, the grains were passed on for many generations within a rather small community but always kept diligently from outsiders. As the story goes, in the early 1900s, a Russian woman named Irina Sakharova managed (after many misadventures) to persuade a Caucasian prince to part with some kefir grains, which she then took to Moscow. Before long, the drink became a staple in the Russian diet, and by now it has spread all over the world. To what does this strange concoction owe its success? Well, first things first: it tastes good. That’s a matter of opinion, of course, but if you like the taste of yogurt or buttermilk, you’ll probably like kefir too. (And if not, you can certainly flavor it with honey, fruit, chocolate syrup, or whatever else strikes your fancy.) Unlike yogurt drinks, though, kefir is very slightly carbonated and (unless specifically engineered not to be) very slightly alcoholic. These properties are barely noticeable—like the tiny bite apple cider gets when it’s sat in your refrigerator just a couple of days too long—but they undoubtedly contributed somewhat to kefir’s popularity. The biggest advantage of kefir over milk or yogurt is in its nutritional properties. The bacteria in kefir are usually referred to as probiotic, or life-supporting. In one sense, this refers to the mutually supportive relationship the various bacteria have with each other. In another sense, it refers to the fact that the bacteria support human life by aiding digestion once they arrive in the intestines. (Kefir also, by the way, produces a mild laxative effect.) According to some reports, the friendly yeasts in kefir can even wipe out pathogenic yeasts that may be found in the body. Kefir is rich in protein, vitamins, and minerals (particularly calcium). And like yogurt, it has very little lactose, making it safe for lactose-intolerant people. Most experts claim that the best kefir is made from raw goat’s milk, but cow’s milk also works, even if it has been pasteurized. If fact, people have made kefir from soy milk, coconut milk, and even fruit juices. But kefir grains differ in the combinations and proportions of bacteria and yeasts they contain, so not every grain is compatible with every food. 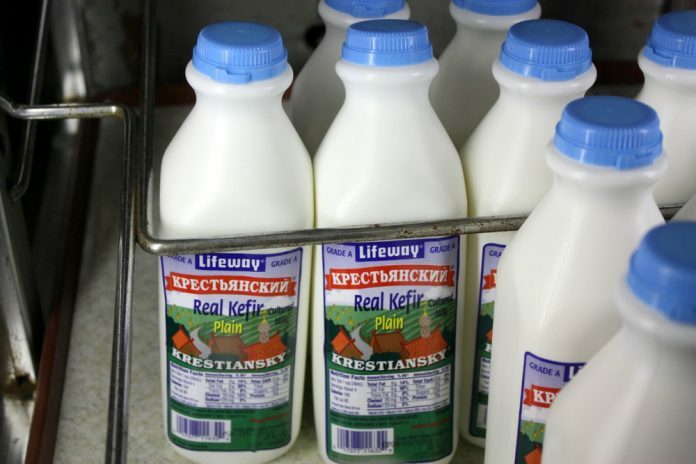 Kefir is sold commercially under numerous brands, but the biggest supplier is Lifeway. (Lifeway bought the second-largest brand, Helios, and continues to sell several Helios-branded organic kefir varieties.) Many who produce their own kefir at home regard these mass-produced varieties as grossly inferior to “real” kefir. One often-heard complaint is that some commercial suppliers, in the name of consistency, use a laboratory-engineered starter powder rather than the authentic kefir grains from the original lineage. Not being a microbiologist, I can’t say precisely what differences such starters might make in the final product—for all I know, store-bought kefir may be chemically and biologically identical to the stuff you can create at home. Be that as it may, since kefir is so easy to make at home, and since the kefir grains can be obtained at virtually no cost, you might want to think twice before buying the bottled product. On the other hand, if the presence of bottled kefir in grocery stores can help to popularize the taste, that can only be a good thing. Note: This is an updated version of an article that originally appeared on Interesting Thing of the Day on April 12, 2005.